1813 ARTICLES OF UNION: The Physical Documents. R W Bro YASHA BERESINER LL.B. The word ‘celebrated’ needs emphasising. The Union had in fact been ‘consummated’, so to speak, on 25 November and ‘ratified’ and confirmed on 1 December 1813. These three key dates have caused some confusion among historians, made worse by the loss of two documents, one of which has since been retrieved and which are the subject of this article. Although the Duke of Kent was only Grand Master Elect at this time, it would have been felt that he was qualified to sign the document as ‘Edward G.M.’. 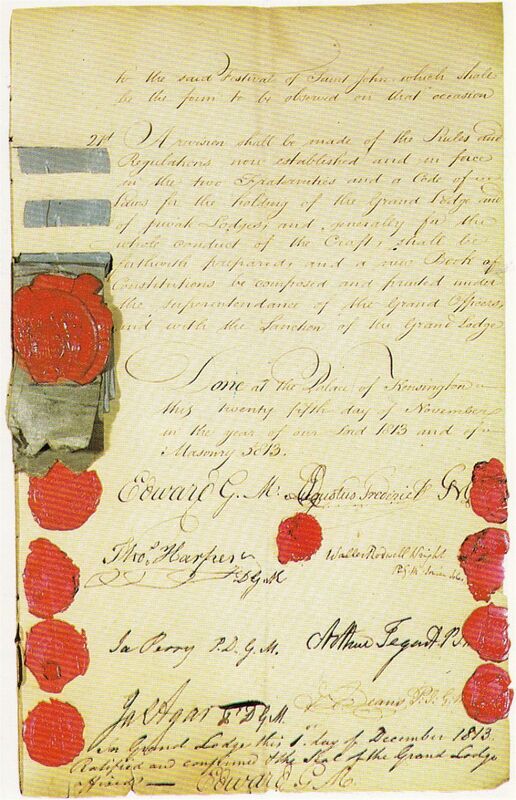 Each Grand Lodge retained their copy of the original signed and sealed Articles of Union. Two particularly significant alterations, among a few minor ones, were made to Article II on these documents. They are revealed in Companion Douglas Burford’s 1993 Royal Arch Batham Lecture ‘The Anomalies of the Royal Arch - Craft Connection’: the words ‘four degrees’ were altered to read ‘three degrees’ and the words ‘Supreme Degree’ in the next line were altered to read ‘Supreme Order’. The indirect consequence of these changes is that these same original documents had to be ‘ratified’ by each Grand Lodge and this was done separately at the ‘Especial Grand Lodge’ meetings, which followed the Duke of Kent’s installation and sumptuous dinner on 1 December. after which the same shall solemnly accepted by the members present. (The second paragraph of Article IX does not appear to have been complied with and is outside the scope of this brief article). Thus the 1st December meeting was to fulfil a pre-determined requirement of the Articles of Union. As incredulous as it may sound, late at night after a long day’s ceremonies and lots of food and drink, the Moderns retired to reassemble at Freemasons’ Hall and the Antients remained at the Crown and Anchor Tavern and they each opened their respective 'Especial Grand Lodges'. Here the Articles of Union were ratified and also confirmed with a second signature of each Grand Master applying his Grand Lodge’s seal. The almost identical ceremonies took place in totally separate locations more or less simultaneously, when each Grand Master acted on behalf of his own Grand Lodge. The added text under which each of the Grand Masters signed, reads: 'In Grand Lodge this first day of December A.D. 1813, Ratified and Confirmed, and the seal of the Grand Lodge affixed'. Thus at this stage of events, on 1 December 1813, the two copies of the Articles of Union are signed and sealed, ratified and confirmed and seals of the two Grand Lodges applied, legally binding the parties to the Union. Fait accompli. As mentioned, this original document of the Articles of Union belonging to the Antients is extant. The Moderns’ (or Premier) Grand Lodge’s version is missing. It was now time to prepare for the Grand Assembly of Freemasons celebrations on 27 December, as required by Article I of the Articles of Union. Among these preparations a decision was taken to produce two larger and engrossed manuscript facsimile copies of the original Articles of Union, one for each Grand Lodge, with a view of their being ceremonially carried into Grand Lodge and signed during the proceedings of 27 December. Both copies of these facsimiles survive and are housed in the archives of the Library and Museum of Freemasonry in London. They are larger than the originals, measuring 300mm x 420mm and elaborate and attractive, with part of the title on the first page highlighted in gold. The corrections to Article II have been incorporated, although clearly these facsimile copies have no legal value or standing. They are not original documents and cannot change the status of the Union already achieved on 1 December nor can they add anything to the agreement of the Union. As facsimile copies of the Articles, they include both date-legends that appear on the original, namely: 'Done at the Palace of Kensington, this 25th Day of November, in the year of our Lord 1813, and of Masonry, 5813' and : 'In Grand Lodge this first day of December A.D. 1813, Ratified and Confirmed, and the seal of the Grand Lodge affixed'. The facsimiles, when presented to the two Grand Masters preceding the 27 December ceremonies, were blank without signatures or seals. As recorded in the proceedings describing the procession into the Grand Hall, each of the two Grand Masters was laden 'with the Act of Union, in duplicate' i.e. one for each Grand Master. They are now signed by the two Grand Masters and their respective Grand Secretaries below the legend reading: 'In Grand Lodge this first day of December A.D. 1813, Ratified and Confirmed, and the seal of the Grand Lodge affixed'. They are witnessed and countersigned: 'In the presence of Count Jacob Pontusson De la Gardie 1st Grand Master of the North'. They were then solemnly and ceremonially placed inside the Ark of the Covenant. It must be borne in mind and emphasised that these two manuscript facsimile copies of the original Articles of Union were representative only, cosmetic copies, so to speak, for show purposes alone. They were, of course, accurate and identical to the signed and sealed originals but the legal aspects of the Union had by now already taken place. 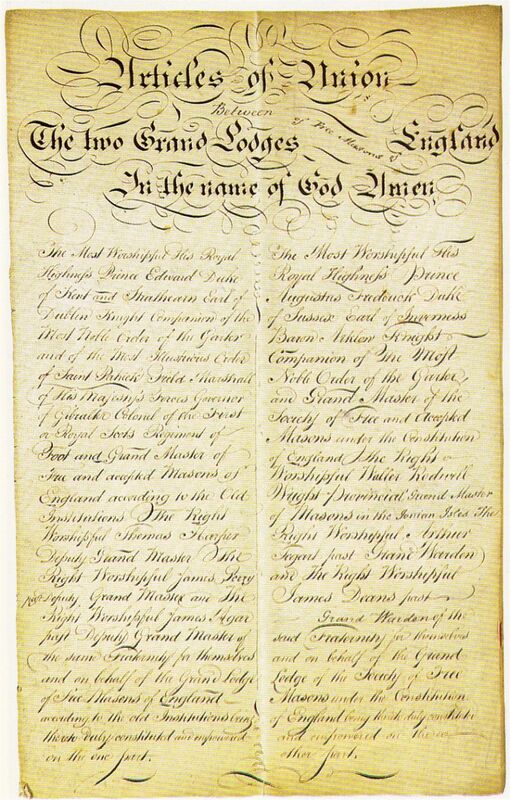 Both documents, now available for inspection, show that they are signed by the Grand Masters and by the Grand Secretaries (the moderns have an added signature) and witnessed by De la Gardie, on the inside back cover of each document, below the legend that reads: 'In Grand Lodge this first day of December AD1813 Rectified and Confirmed and the seal of the Grand Lodge affixed’. As expected, there are no seals or signs that any seals were ever applied. There was no need for seals. Furthermore although the event was taking place on 27 December 1813, the document being signed was dated, quite correctly, 1 December 1813. The events of 27 December 1813 were a symbolic show and celebration of unity, the Union already having been achieved on 1 December. The facsimile copy of the Articles of Union belonging to the Antients was subsequently selected for use as the 'Master' or official document of the Union and was accordingly handsomely bound in a decorated and embossed velvet cover. The copy was signed by the four signatories of the Antients (it is presumed the Moderns never bothered to sign this document or may never have been asked) and, until recently, it was carried into Grand Lodge at each Quarterly Communication in the special satchel still in use today and on display at the Museum of Freemasonry. The facsimile belonging to the Moderns (or Premier) Grand Lodge has an interesting pedigree, as reported to the author in private correspondence by Susan Snell, Archivist and Records Manager at the Library and Museum of Freemasonry and a former British Records Association (BRA) archivist. She writes that the document concerned, accessioned as ‘BRA 1607’ together with a large quantity of other unrelated documents, was deposited with the BRA on 12 August 1968 from the College of Arms via the Historical Manuscripts Commission (HMC) as a gift. The British Records Association acts as an archives clearing house for London solicitors’ papers and other records of potential historical interest. On 16 January 1976, Janet Foster, then the BRA archivist, wrote to Grand Lodge and the document was subsequently delivered to James Stubbs, Grand Secretary at the time, at Charterhouse where he was residing. The receipt of the document ‘despatch number 1662’ is acknowledged with thanks in a letter from the United Grand Lodge of England addressed to the BRA dated 5 February 1976. The relatively late discovery of the document may explain why it has not been referred to by several authors who have written on the subject, and who may have reached different conclusions had the existence of a Moderns’ version of the facsimile copy been known to exist. The Articles of Union dated 25 November 1813 signed and with the seals of the two Grand Masters and their commissioners . The last three lines below the signatures and seals are the ratification and confirmation 'in Grand Lodge' (namely of the Antients) dated 1 December 1813 and signed by 'Edward' Grand Master of the Antients. The large seal to the left centre of the document is also that of the Antients Grand Lodge. This document is preserved in the archives of the Library and Museum of Freemasonry in London. An identical document with the signature of the Duke of Sussex at its base and the large seal of the Moderns (or Premier) Grand Lodge of England is currently missing. My thanks are extended to the very patient Martin Cherry, knowledgeable Librarian of the Library and Museum of Freemasonry for his unhesitant assistance and Bro John Hamill for sharing with me his views on the subject. John Belton, whose excellent book 'The English Masonic Union of 1813' has recently seen the light of day, has proven to be a friend and gentleman of the greatest value. Finally, I have mentioned Bro Douglas Burford and Susan Snell in the text.